Vinyl Record Album Collecting in Chicago and the USA: #600! I've been approaching 600 LPs for a while but I never thought it would come via such a strange route. I decided a while ago that 600 would be the end of the road for me. Not for collecting in general of course - but basically my upper limit. I have been planning to 'trim the hedges' for a while and pull out some of the really silly stuff I've grabbed over the years so it can be donated to a local thrift store (or sold on discogs if its actually valuable...but if that's the case it probably wouldn't be a candidate to leave the collection in the first place). A big part of this I must admit is just simple weight. If I have 600 records I'll bet that it weighs closer to 700 lbs. 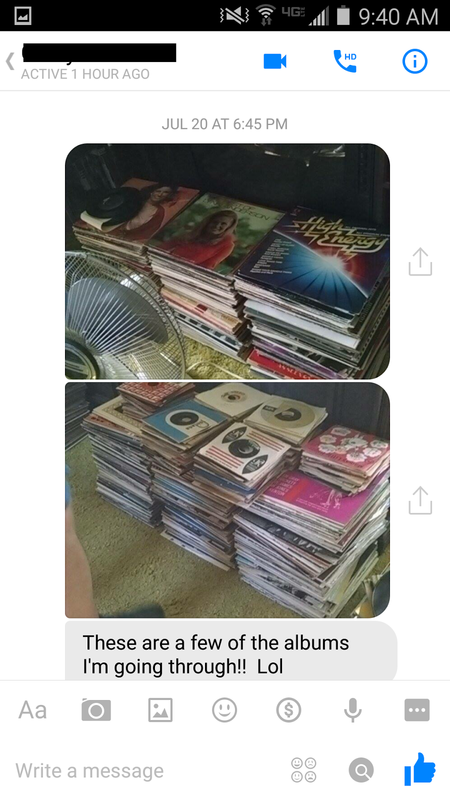 Now add in the 100+ 7"s I have, plus their wooden bin. Then the two piece bin and hutch which I already know weigh over 150 lbs each. I am easily at 1000 lbs there in just a 5' x 2' (ballpark) area of a room and I live in a second floor condo. I'm sure its safe at current levels but that hutch can easily hold enough records to get me to 1000 I think and then we are getting closer to a solid ton of vinyl! And there is no way I think that is safe. And more importantly, its about clutter. As time has gone on, I have become more mature about what I grab and not satisfying myself with 'consolation prizes' so often but for a long time I did. So I know I can prune back the collection without getting rid of good stuff but the truth is that I just do not listen to a lot of these and maybe never have! Maybe I can justify that on some level by saying that I am a 'collector' after all but I do prize myself on the fact that I do listen to so many of these records...I don't just buy stuff because 'oh I've heard of this person' and nonsense like that. At any rate I have reached my limit but that does not mean that any of this stops, my interest (obsession) is as strong as ever and I think it is a natural progression to find a reasonable stopping point and let yourself be more intimate with the vinyl you have, rather than bringing in arm loads of new stuff 'just because'. Or maybe all of this is just a way for me to rationalize my decision. Either way I found myself confronted with #600 in the most unique way. 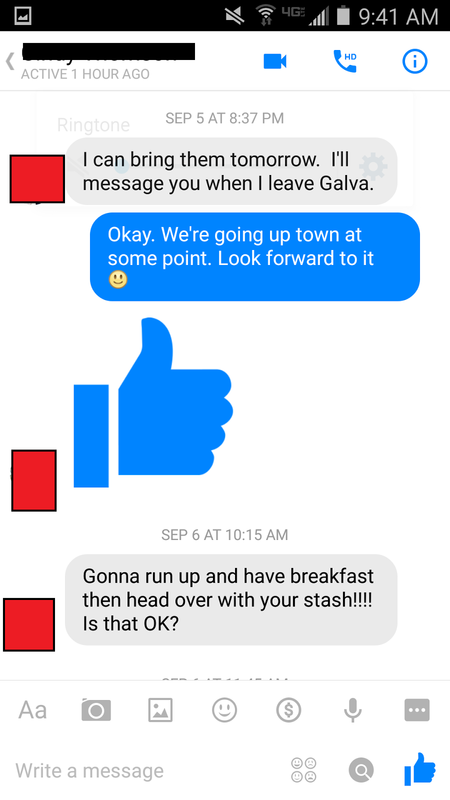 I had taken a weekend to drive out west to the town my girlfriend is from which is a few hundred miles away. We have made the journey before and its fun to hang out and crank back beers in her mom's garage and run the grill. This weekend was special because there was a large annual festival in town as well as an organized bike ride so I had my bike, disassembled in the trunk, in tow. 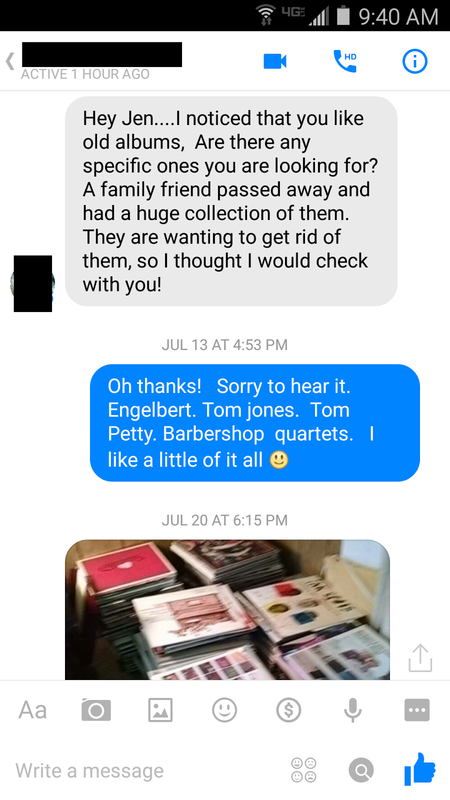 When we got out there, my girl told me that someone she knew had offered her some records they got from the estate of a deceased friend. Apparently they had a couple hundred at least so they asked what styles/artists/etc we might be interested in. Release Me - I have many copies of this, three of them mono in varying conditions. What we have here is a very clean mono copy - very jealous though it was only sensible to let my girl have it. Say You'll Stay Until Tomorrow - Tom's second album after leaving Parrot. I still haven't finished the Parrot collection (still waiting to find the 2xLP I need) but no way I was going to turn this one away. I (Who Have Nothing) - I scooped this one a while back (at Terry's) so I let my girl have it, she has at least one other Tom album already. This one is only in stereo as well so no chance this was a variant I needed. Home Is Where The Heart Is - I guess that pretty much every 'old record collection' has some Tom and Eng in it so I guess I shouldn't be so pleased with the above results. But the 'barbershop quartet' request usually gets a blank stare in response. Not this time - somehow the planets aligned and yes indeed my 600th album is this Buffalo Bills mid-career classic in great shape. I guess it is a toss up of which of these is technically #600 since I got them at the same time but for honorary reasons if nothing else, I'm going to choose the close harmony LP. And just like that, the milestone has come and gone, far from home in a garage, with records delivered by an unseen person. But there would be more! My girl's connection sent another communication saying that we could look through the entire collection if we wanted. We offered instantly to come to whereever that was (it had to be near) but she offered to bring them all to us! I couldn't understand that until I learned that this was basically a way to dump them all on us, so we could take what we liked and bring the rest to Goodwill or the garbage dump. So once again, while we were away on a day trip, we returned to vinyl greeting us. But this time it wasn't just four records, or even four boxes. It was much, much more. What could be more fun than digging through crates of records that were delivered just for you? Not much. I was controlled however and pulled out only three more records - I knew I had broken the threshold and needed to be controlled. 4 Kings Of Country Music - I grabbed this primarily for the Roger Miller but the whole thing is a delight. Hearing mid 60s George Jones is something else - that voice - and the more I dig into Jimmy Dean the more I like. I read a book not too long ago about the Bakersfield Sound which focuses strongly on Buck Owens so I'm glad to have some recordings (albeit only two tracks) to connect with that. The Roger Miller is kind of ridicolous - to hear him (try to) sing straight ahead 'heartbreak' country songs without even a modicum of the comedic genius he is known for seems flippant. But I guess we all have to get started somewhere. ....Escape - I have a strange connection to this one. I have the 2nd place world record for the Atari game of the same name. I have a number of ranking scores for the Atari 2600 and other platforms but this one required that I play for a couple hours non stop of extremely tedious, repetitive gameplay. More importantly, my record is bookended by two gamers that are in the annals of video game history. My girl pulled out a huge stack of stuff including a monster Elvis boxset and a MINT copy of the Grease soundtrack that still had an order form inside to buy a mail order T-shirt! My girl's brother in law stopped by and pulled out a handful and he doesn't even collect. When we left, my girl grabbed a full milk crate stuffed with candidates for another friend back home. So probably 50 platters got snatched in a couple hours - its a beautiful thing. Dusty old vinyl and garages go hand in hand. I considered taking this one just because but let my girl have it instead.